ONTRApages and Legacy Landing Pages can be hosted either on one of ONTRAPORT's domains or on your own domain. We recommend you use the new ONTRApages for the most flexibility in design and mobile responsiveness. After you have created a Landing Page it can be hosted either on one of ONTRAPORT's domains (like respond.ontraport.net) or on your own domain. 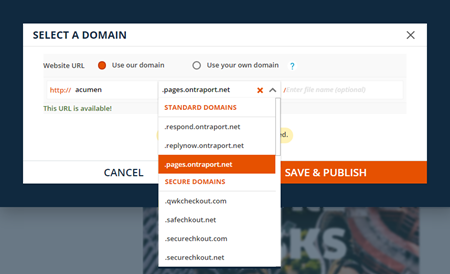 If you decide you'd like to use one of ONTRAPORT's domains you can simply select it after clicking the Publish button in ONTRApages (or, the Page URL button in Legacy Landing Pages). Then type a unique sub-domain on the left, an optional page name after the ONTRAPORT domain, and your webpage will be available online as soon as you save the page. You can use the same subdomain on other pages by filling in the [optional file name] field with a page name. ONTRAPORT will add a SSL certificate, using the HTTPS protocol for secure form submission, to all ONTRAPORT domains by the fall of 2018. Note: Editing your domain's zone file can result in the loss of all existing data. If you are not familiar with these procedures please enlist the help of someone experienced in editing DNS records. Existing domains with content: if you have existing content on your domain you cannot use it for hosting landing pages unless it is a WordPress site. The ONTRApages plugin allows you to include an ONTRApage on your existing site without doing anything else. You don't need to worry about name servers, DNS records, etc.and all of your other content will remain on the site. An experienced developer or one of our Certified Consultants may be able to assist you in creating a "wildcard" A record to allow ONTRAPORT landing pages to be hosted on subdomains of a website with other content. An example of a subdomain is "offers.your-domain.tld" where "offers" is the subdomain. This is a complex solution that is not supported by all registrars, so we no longer recommend doing it yourself. Note: If you have content on the domain using any of the methods explained below will make your existing website content "disappear". If you do not have ANY content on the domainand you are not currently using the domain for email, you can edit your domain's zone file to host landing pages on ONTRAPORT's servers. No other content can be hosted on the domain. There are two methods. You may be able to use third party email services to have email addresses for the domain. For example, you can buy an email service such as GSuite / Google Apps, and have ONTRAPORT enter the necessary information into our name servers manually. Entering the MX records can take 1 to 2 business days depending on our workload. Remember that the domain name server change has to propagate before we can add the MX records, so this delay can take up to 4 days. You cannot add other zone file records such as TXT, CNAME, etc. yourself. As in item c, you can request other records be added through a support ticket. You cannot host other content on the domain. You may be able to use third party email services to have email addresses for the domain. Check with your domain registrar to see if you can use their control panel to add email addresses and specify a mail provider using MX records. If you are adding the MX records for the first time it can take up to 48 hours for email to start flowing to the email addresses on that domain. If the MX records are already in place, and you are already using a third party email service such as GSuite / Google Apps or Pegasus Email, adding the A record above will only point the web site to our servers, and email should be unaffected. Note: Changing the zone file for your domain can lead to the loss of your website content. If you are unsure of what you are doing we strongly recommend hiring someone experienced with editing zone records. ONTRAPORT will add a SSL certificate for the HTTPS protocol to any domain pointed to our servers. When exactly can we expect HTTPS encryption? Currently still HTTP and getting complaints from customers that the forms we are using are not safe?